When possible, we revise and finalize our localizations of cards, after conducting additional research. You can use the [(1)st] effect with this card’s name only once per turn. (1) If this card is in your hand: You can target 1 Level 3 or higher monster you control; reduce that monster’s Level by 2, also Special Summon this card from your hand. You can use the (2)nd effect with this card’s name only once per turn. (1) Once per turn: You can target 1 Level 4 or lower monster you control; until the end of this turn, increase its Level by its original Level. (2) If a monster(s) you control in an Extra Monster Zone(s) would be destroyed by battle or card effect, you can banish this card from your GY instead. You can use only 1 effect among the (2)nd and (3)rd effects with this card’s name per turn, and only once that turn. (1) During the turn a monster is Link Summoned using this card as material, that Summoned monster cannot be destroyed by battle or card effects. (2) If this card is Special Summoned from the GY: You can target 1 FIRE monster in your GY; add it to your hand. (3) If this card is added from your GY to your hand by a card effect: You can reveal it, then target 1 FIRE monster in your GY; add it to your hand. (1) When an opponent’s monster declares an attack: You can Special Summon this card from your hand in Attack Position. (2) If this card is Special Summoned: You can target 1 “Salamangreat” monster in your GY; this card’s ATK becomes that monster’s ATK. (3) You can Tribute this card; gain 2000 LP. You can use only 1 effect among the (1)st and (2)nd effects with this card’s name per turn, and only once that turn. (1) If 3 or more “Salamangreat” monsters are in your GY: You can send this card from your hand to the GY, then target 1 “Salamangreat” Link Monster in your GY and 1 card in your opponent’s Spell & Trap Zone; return the targeted monster in the GY to the Extra Deck, and if you do, destroy the targeted card on the field. (2) If a card in your opponent’s Spell & Trap Zone is destroyed and sent to the GY while this card is in the GY: You can Special Summon this card in Defense Position. (1) When you take effect damage: You can Special Summon this card from your hand, then inflict damage to your opponent equal to the damage you took, and if you do, gain LP equal to half the damage you inflicted. (2) When this card is Tribute Summoned: You can add, from your Deck to your hand, 2 “Rokket” monsters with different names. (1) When this card is Normal Summoned: You can Special Summon 1 “Neo-Spacian” monster or “Elemental HERO Neos” from your hand or Deck in Defense Position. (2) You can Tribute this card, then target 1 “Neo-Spacian” monster or “Elemental HERO Neos” in your GY; Special Summon that monster in Defense Position. (1) If this card is Normal/Special Summoned: You can target 1 Level 4 or lower “T.G.” monster in your GY, except “T.G. Screw Serpent”; Special Summon that monster, but it has its effects negated. (2) You can banish this card from your GY, then target 1 “T.G.” monster you control; until the end of the turn, either increase or decrease that monster’s Level by 1. You can Special Summon a card(s) with this card’s name only once per turn via the way listed in this card’s (1)st effect. (1) If you control a “T.G.” monster, you can Special Summon this card (from your hand). (2) Once per turn, during the End Phase, if this card is in the GY because it was destroyed on the field and sent there this turn: You can add 1 “T.G.” monster from your Deck to your hand, except “T.G. Booster Raptor”. (1) This card you control can be treated as a non-Tuner monster when used for the Synchro Summon of a “T.G.” Synchro Monster. (2) If this card is sent to the GY as material for the Synchro Summon of a “T.G.” Synchro Monster: You can Special Summon 1 “T.G. Token” (Machine/EARTH/Level 1/ATK 0/DEF 0) in Attack Position. As the serpent devours the dream of the protector. The other lies where all shall end. — Here, this star, this world, this divine prison, shall be unlocked. (1) If a Normal Monster(s) is sent to your GY (except during the Damage Step): You can Special Summon this card from your hand. (2) If this card is in your GY: You can send 1 Dragon monster from your hand to the GY; add this card to your hand. (1) You can send this card that is in your hand or face-up on your field to the GY, then target 1 Dragon monster you control; it gains 500 ATK/DEF until the end of your opponent’s turn. (2) If a Normal Monster(s) is sent to your GY while this card is in your GY (except during the Damage Step): You can Special Summon this card, but banish it if it leaves the field. Must be Special Summoned by a card effect. (1) If this card is Special Summoned from the hand or Deck: You can double this card’s original ATK/DEF until the end of the next turn. (2) If this card is Special Summoned from the GY, or if this card is Special Summoned while banished: You can target 1 monster your opponent controls; destroy that monster. You can use each effect among the (1)st and (3)rd effects with this card’s name only once per turn. (1) If a Link Monster(s) you control is destroyed by an opponent’s card effect and sent to your GY: You can send this card from your hand to the GY, then target 1 of those Link Monsters; Special Summon that monster. (2) This card can be treated as 2 Tributes for a Tribute Summon. (3) If your opponent Special Summons a monster(s) from the Extra Deck while this Normal Summoned/Set card is in your Monster Zone: You can send 1 monster from your Deck to the GY. (1) You can Tribute this card, then target 2 of your banished Zombie monsters that are not named “Shiranui Spectralsword of Sunset”, including a “Shiranui” monster; for the rest of this turn, you cannot Special Summon monsters, except Zombie monsters, also Special Summon those monsters in Defense Position, but they have their effects negated. (1) If this is card is in your GY and you control 2 or more “Shiranui” monsters with different names: You can Special Summon this card, but banish it when it leaves the field. (2) If this card is banished: You can target 1 Zombie monster you control; that monster gains 600 ATK until the end of this turn. (1) When this card is Normal Summoned: You can activate this effect; for the rest of this turn, you cannot Special Summon monsters, except Zombie monsters, also Special Summon 1 “Shiranui Spectralsword” monster from your hand or Deck. (2) If this card is banished: You can draw 1 card, then discard 1 card. (1) If your opponent Special Summons a Link Monster: You can Special Summon this card from your hand, then draw cards equal to the number of Link Monsters your opponent controls + 1, and if you do, shuffle into your Deck cards from your hand equal to the number of Link Monsters your opponent controls. (2) When an opponent’s card or effect is activated that targets a monster(s) you control (Quick Effect): You can discard 1 card; negate that activation, and if you do, destroy it. (1) Cannot be destroyed by battle with a Link Monster. (2) You can banish this card from your GY, then target 1 face-up monster on the field; until the end of the turn, you cannot Special Summon monsters, except DARK monsters, also send 1 DARK Machine monster from your Deck to the GY, except “Orcustrated Knightmare”, and if you do, the targeted monster gains ATK equal to the sent monster’s Level x 100. (1) If this card is sent to the GY as material for the Fusion Summon or Link Summon of a “Prank-Kids” monster: You can banish 1 card from your hand, and if you do, draw 1 card, then you can Special Summon 1 “Prank-Kids” monster from your hand or Deck in Defense Position, except “Prank-Kids Rocksies”. (1) If there are no monsters in your GY: You can Special Summon this card from your hand. (2) If this card is Special Summoned: You can activate this effect; for the rest of this turn, you cannot Special Summon monsters, except “Madolche” monsters, also Special Summon 1 “Madolche” monster from your hand or Deck, except “Madolche Puddingsis”, but its Level is decreased by 1. (3) If this card is destroyed by your opponent’s card and sent to the GY: Shuffle this card into your Deck. (1) If you control a Level 3 monster not named “Psychic Wheeler”, you can Special Summon this card (from your hand) in Defense Position. (2) If this card is sent to the GY as material for the Synchro Summon of a monster: You can target 1 monster on the field with ATK lower than that Summoned monster’s; destroy it. (1) If you control a Level 3 monster not named “Psychic Tracker”, you can Special Summon this card (from your hand) in Defense Position. (2) A monster Synchro Summoned using this card as material gains 600 ATK. (1) When your opponent activates a monster effect, if this card was Special Summoned (Quick Effect): You can Tribute this card; negate that activation, and if you do, destroy it. (2) If this card is sent from the field to the GY: You can Special Summon 1 Thunder monster from your hand in Defense Position. You can use only one effect among the (1)st and (2)nd effects with this card’s name per turn, and only once that turn. (1) If this card is added from your Deck to your hand: You can reveal it; Special Summon it. (2) If this card is added from your GY to your hand by a card effect: You can reveal it; Special Summon it, but banish it if it leaves the field. (1) If a face-up FIRE monster(s) you control is destroyed by battle or your opponent’s card effect: You can Special Summon this card from your hand, then you can inflict damage to your opponent equal to half the ATK of 1 of those destroyed FIRE monsters in your GY. (1) Once per turn, when this card is targeted for an attack by an opponent’s monster: You can move this card to another of your Main Monster Zones, then Special Summon 1 “Ink Token” (Aqua/WATER/Level 2/ATK ?/DEF 0), whose ATK is equal to that opponent’s monster’s ATK. (2) Your opponent’s monsters with ATK lower than this card’s DEF cannot target this card for attacks while this card is in your rightmost or leftmost Main Monster Zone. (1) When this card is Normal Summoned: You can banish 1 monster from your hand; banish 1 monster with the same Type from your Deck. (2) If this card is destroyed by battle, or if this card in its owner’s possession is destroyed by an opponent’s card effect: You can target 1 of your banished monsters; add that monster to your hand. (1) When a monster in an Extra Monster Zone is sent to the GY while this card is in your GY, because that sent monster was destroyed by battle with a monster in a Main Monster Zone: You can Special Summon this card in Defense Position to that sent monster’s owner’s field. (2) If this card is destroyed and sent to the GY, and it was Special Summoned by its (1)st effect: Draw 1 card. You can Ritual Summon this card with “Impcantation Celebration”. You can use only 1 effect among this card’s (1)st and (2)nd effects per turn, and only once that turn. (1) You can reveal this card in your hand; you will lose 2500 LP during the End Phase of this turn if you did not Special Summon a Ritual Monster this turn after activating this effect, also discard 1 card, and if you do, Special Summon 1 “Impcantation” monster from your Deck. (2) You can send to the GY 1 “Impcantation” card that is in your hand or face-up on your field, then target 1 monster your opponent controls; destroy that monster. (1) Double any damage inflicted to your opponent by the effect of a “Trickstar” Link Monster you control that is linked to this card. (2) Each time your opponent takes damage from a “Trickstar” monster effect: This card gains ATK equal to that damage. (3) Once per turn, during the End Phase, if this card attacked this turn: Have the ATK gained from this card’s (2)nd effect return to 0, then you can add 1 “Trickstar” monster from your GY to your hand. (1) If this card is Fusion Summoned: You can activate this effect; for the rest of this turn, this card gains ATK equal to half the total original ATK of the monsters used as material for its Fusion Summon. (2) Once per battle, if this card is battling a monster whose ATK is different from its original ATK, during damage calculation: You can activate this effect; double this card’s ATK, during this damage calculation only. (3) If this card was Fusion Summoned using “Salamangreat Violet Chimera” as material, the ATK of any monster this card battles becomes 0, during damage calculation only. (1) Gains 100 ATK for each “Neo-Spacian” monster and “HERO” monster in your GY. (2) When this card destroys an opponent’s monster by battle: You can add, from your Deck to your hand, 1 Spell/Trap that specifically lists the card “Elemental HERO Neos” in its text. (1) If this card is Special Summoned from the Extra Deck: You can activate this effect; for the rest of this turn, your opponent cannot activate cards, also cards your opponent controls cannot activate their effects. Your opponent cannot activate cards or effects in response to this effect’s activation. (2) Once per turn, during the End Phase: Return this card to the Extra Deck, and if you do, destroy all cards your opponent controls. (1) If this card is Synchro Summoned: You can equip 1 Link Monster from your GY to this card, and if you do, place Borrel Counters on this card equal to that monster’s Link Rating. (2) This card gains ATK equal to half the ATK of the monster equipped to this card by this card’s effect. (3) When an opponent’s card or effect is activated (Quick Effect): You can remove 1 Borrel Counter from this card; negate that activation. (1) While you control a Link Monster, your opponent cannot target monsters you control for attacks or with card effects, except this one. (2) Once per turn, if this card battles an opponent’s monster, at the start of the Damage Step: You can return that opponent’s monster to the hand, also, if this effect is activated because this card attacked, this card can make a second attack in a row. (1) If this card is Special Summoned: You can target 1 “T.G.” monster in your GY; add that monster to your hand. (2) During your Main Phase: You can Special Summon 1 “T.G.” monster from your hand. (3) Once per Chain, during your opponent’s Main Phase, you can (Quick Effect): Immediately after this effect resolves, Synchro Summon using this card you control. You can Special Summon “Shiranui Skillsaga(s)” only once per turn. (1) If this card is Special Summoned: You can target 1 monster on the field; change its battle position. (2) If this card is banished: You can Special Summon 1 “Shiranui Token” (Zombie/FIRE/Level 1/ATK 0/DEF 0). You can Special Summon “Shiranui Spiritsaga(s)” only once per turn. (1) Once per turn: You can banish 1 monster that is in your GY or face-up on your field, then you can apply each and/or all appropriate effects among these, in sequence, depending on what that banished monster is. • If a Zombie monster: All monsters you control gain 300 ATK. • If a FIRE monster: Destroy 1 Spell/Trap Card on the field. • If a Synchro Monster: Destroy 1 monster on the field. (1) Each monster with ATK lower than this card’s cannot attack, also each monster on the field with ATK higher than this card’s cannot activate its effects. (2) If this card in your possession is destroyed by an opponent’s card and sent to your GY: You can target 2 monsters in your GY that have the same Type and Attribute (1 Tuner and 1 non-Tuner); add them to your hand. 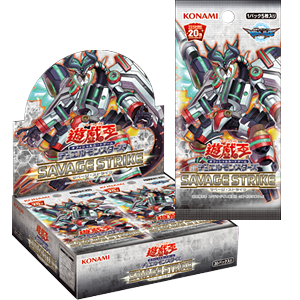 (1) If this card is Synchro Summoned: You can activate this effect; you cannot Special Summon monsters for the rest of this turn, except Cyberse monsters, also Special Summon in Defense Position 1 Cyberse Tuner monster from your hand or GY. (2) If this Synchro Summoned card is sent to the GY: You can draw 1 card. (1) This Link Summoned card cannot be destroyed by battle or card effects. (2) Cyberse monsters this card points to cannot be destroyed by card effects. (3) If a monster(s) is Special Summoned to your zone this card points to, while this monster is on the field: You can banish 1 Cyberse monster from your GY; add to your hand 1 Cyberse Tuner monster from your Deck. (1) Once per battle, if a Cyberse monster you control battles, during damage calculation: You can activate this effect; Negate all other card effects on the field until the end of the Damage Step, also damage calculation for this battle uses each monster’s original ATK and DEF, also inflict 1000 damage to your opponent when a monster they control is sent to the GY because it was destroyed by this battle. (2) If this card is sent to the GY as Link Material for the Link Summon of a monster: You can activate this effect; that Link Monster can make a second attack during each Battle Phase this turn. (1) Once per turn, if this card is battling a face-up monster that is not a Link 3 or higher Link Monster, at the start of the Damage Step: You can destroy that monster. (2) Once per turn: You can Tribute 1 monster this card points to, then target 1 monster your opponent controls; destroy that monster. (1) You can Tribute this card; choose 1 Fusion Monster in your GY and return it to your Extra Deck, then Fusion Summon 1 Fusion Monster with the returned monster’s name from your Extra Deck, by banishing Fusion Materials listed on it from your GY. (2) If this card is banished from your GY: You can activate this effect; until the end of the turn, all Special Summoned monsters your opponent currently controls lose 400 ATK for each Cyberse monster in your GY. (1) If a monster(s) is Normal/Special Summoned to a zone(s) this card points to: You can add 1 FIRE monster from your GY to your hand, and if you do, you cannot Normal Summon, Normal Set, or Special Summon it, or a monster with its name, for the rest of this turn. (2) During your Main Phase, if this card was Link Summoned using “Salamangreat Sunlight Wolf” as material: You can add 1 “Salamangreat” Spell/Trap from your GY to your hand. (1) You can only control 1 face-up “Trickstar Divaridis”. (2) If this card is Special Summoned: You can inflict 200 damage to your opponent. (3) Each time your opponent Normal/Special Summons a monster(s): Inflict 200 damage to your opponent. (1) If this card is Link Summoned: You can activate this effect; for the rest of this turn, you cannot Special Summon monsters, except “T.G.” monsters, also Special Summon 3 “T.G.” monsters in Defense Position (1 each from your hand, Deck, and GY) to your zones this card points to. (2) Your opponent cannot target “T.G.” Synchro Monsters this card points to with card effects. You can Special Summon “Elpi the Guardragon(s)” only once per turn. (1) You cannot Special Summon monsters, except Dragon monsters. (2) During your Main Phase: You can Special Summon 1 Dragon monster from your hand or Deck to a zone on your field that 2 or more Link Monsters are pointing to. You can Special Summon “Pisti the Guardragon(s)” only once per turn. (2) You can target 1 Dragon monster in your possession that is banished or in the GY: Special Summon it to a zone on your field that 2 or more Link Monsters are pointing to. You can only Special Summon “Agapain the Guardragon” once per turn. (2) During your Main Phase: You can Special Summon 1 Dragon monster from your Extra Deck to EITHER a zone on your field that 2 or more Link Monsters are pointing to, OR an Extra Monster Zone that 2 or more Link Monsters are pointing to. (1) Synchro Monsters you control cannot be destroyed by card effects. (2) FIRE monsters you control cannot be destroyed by battle. (3) During your opponent’s turn (Quick Effect): You can target 1 of your banished Zombie Synchro Monsters; Special Summon it to your zone this card points to. You can Special Summon “Sky Striker Ace – Kaina(s)” only once per turn. (1) If this card is Special Summoned: You can target 1 face-up monster your opponent controls; that monster cannot attack until the end of your opponent’s turn. (2) Each time you activate a “Sky Striker” Spell Card or a “Sky Striker” Spell effect, gain 100 LP immediately after it resolves. (1) You can target 1 FIRE monster in your opponent’s GY; Special Summon it to your zone this card points to. (2) If this Link Summoned card is destroyed by battle, or is destroyed by an opponent’s card effect while in its owner’s Monster Zone: You can add 1 FIRE monster with 1500 or less DEF from your Deck to your hand. (1) Fusion Summon 1 “Salamangreat” Fusion Monster from your Extra Deck, using monsters from your hand or either side of the field as materials. You can use each effect among the (2)nd and (3)rd effects with this card’s name only once per turn. You cannot Special Summon monsters the turn you activate any effect among the (2)nd and (3)rd effects with this card’s name, except “Trickstar” monsters. (1) When this card resolves, you can add 1 “Trickstar” monster from your GY to your hand. (2) If you control a “Trickstar” Link Monster: You can Special Summon 1 “Trickstar Token” (Fairy/LIGHT/Level 1/ATK 0/DEF 0). (3) If your opponent controls a card in their Spell & Trap Zone: You can Special Summon 1 “Trickstar Token”. (1) Fusion Summon 1 “Trickstar” Fusion Monster from your Extra Deck, using monsters from your hand or field as Fusion Material. (2) You can banish this card from your GY, then target 1 “Trickstar” monster in your GY; add that monster to your hand, and if you do, you cannot Normal Summon, Normal Set, or Special Summon it, or a monster with its name, for the rest of this turn. (1) For the rest of this turn after this card resolves, you cannot Special Summon monsters, also send to the GY, from your hand, Deck, or field, Fusion Materials listed on a Fusion Monster that lists exactly 2 monsters, including “Elemental HERO Neos”, as Fusion Material, then Special Summon that Fusion Monster from your Extra Deck, ignoring its Summoning conditions. (2) If a Fusion Monster you control that lists “Elemental HERO Neos” as Fusion Material would be destroyed by battle or card effect, or returned to the Extra Deck by its own effect, you can banish this card from your GY instead. (1) You can target 1 Dragon monster you control; until the end of your opponent’s turn, it gains ATK/DEF equal to the combined Link Rating of all Link Monsters on the field x 100. (2) Once per turn, if exactly 1 Dragon monster you control (and no other cards) would be destroyed by battle or card effect, you can send 1 Normal Monster from your hand or Deck to the GY instead. (1) When this card is activated: You can target 1 Level 4 or lower Dragon monster in your GY; either add it to your hand or Special Summon it. (2) Once per turn: You can target 1 Dragon monster you control; move it to another Main Monster Zone on your field. (1) If your opponent controls a monster: Discard 1 Zombie monster; for the rest of this turn after this card resolves, you cannot Special Summon monsters, except Zombie monsters, also Special Summon, from your Deck or GY, 1 “Shiranui” monster with a different name from the discarded monster’s. (1) This card’s name becomes “Shiranui Style Synthesis” while it is in the Spell & Trap Zone. (2) Once per turn: You can activate 1 of these effects. • Banish 1 Zombie monster from your GY; for the rest of this turn, your Zombie monsters’ Normal Summons and Special Summons cannot be negated. • Target 1 Zombie monster you control; banish that monster, then you can send 1 Zombie monster with 0 DEF from your Deck to the GY. This card is used to Ritual Summon a Ritual Monster. You can use the (2)nd effect with this card’s name only once per turn. (1): Tribute “Impcantation” monsters from your hand and/or your field, and Ritual Summon 1 Ritual Monster from your hand after that, whose Level is equal to or greater than the combined Level of the Tributed monsters. (2): If this card is in your GY: You can send to the GY 1 “Impcantation” card that is in your hand or face-up on your field, except “Impcantation Celebration”; Special Summon 1 “Impcantation” monster from your Deck, then add this card from your GY to your hand. (1) Target 1 Tuner monster in either player’s GY and 1 face-up monster on the field; banish that targeted monster in the GY, then, until the end of the turn, treat the targeted monster on the field as a Tuner whose Level becomes that banished monster’s Level. (1) At the start of your Main Phase 1: Banish either 3 or 6 random face-down cards from your Extra Deck, face-down; draw 1 card for every 3 cards banished to activate this card, also for the rest of this turn after this card resolves, you cannot draw cards with card effects. (1) If your LP is lower than your opponent’s: Target 1 face-up monster your opponent controls; inflict damage to your opponent equal to half that monster’s original ATK, also for the rest of this turn after this card resolves, your opponent takes no damage. (1) Each time your opponent Summons a monster(s), gain 300 LP. (2) While your LP is 10000 or higher, monsters you control cannot be destroyed by battle. (1) Each time a monster(s) is Special Summoned, place 1 Summon Counter on this card (max. 6). (2) While 6 Summon Counters are on this card, this card cannot be destroyed by card effects. (3) At the start of Main Phase 1, if 6 Summon Counters are on this card: The turn player can activate this effect; send this card to the GY, and if they do, send all Special Summoned monsters their opponent controls to the GY. If you control no cards, you can activate this card from your hand. (1) Special Summon, in Defense Position, any number of monsters from your hand and/or GY with different names that are “Neo-Spacian” monsters and/or “Elemental HERO Neos”, but those Summoned monsters have their effects negated (if any), and while any of those Summoned monsters are face-up on your field, you cannot Special Summon monsters from the Extra Deck, except Fusion Monsters. (1) You can send 1 Effect Monster from your hand to the GY; Special Summon in Defense Position 1 Level 4 or lower Dragon Normal Monster from your hand, Deck, or GY. (1) Tribute 1 Dragon monster, then target 2 cards on the field; destroy them. (1) Special Summon 1 Zombie monster from your hand, but banish it if it leaves the field. (2) You can banish this card from your GY, then target 1 Zombie monster you control; for the rest of this turn, that Zombie monster is unaffected by card effects, except its own. (1) Target 1 monster in either player’s GY that cannot be Normal Summoned/Set: Special Summon it. (1): Tribute 2 Machine monsters, then target 1 monster in your GY, or up to 2 instead if your opponent controls a Link Monster; Special Summon that monster(s). (1) Activate 1 of these effects, also, after that, Set this card face-down instead of sending it to the Graveyard. • Send to the GY 1 monster that is either in your hand or face-up on your field, and if you do, add, from your Deck to your hand, 1 Flip Monster with the same Attribute as the sent monster, but a different name. • Send to the GY 1 Flip Monster that is either in your hand or face-up on your field, and if you do, add, from your Deck to your hand, 1 monster with the same Attribute as the sent monster, but a lower original Level. (1) You can send to the GY 1 monster that is in your hand or on your field; draw 1 card. (1) If your opponent negated the Normal/Special Summon of a monster, or if your opponent negated the activation of a card or effect: Destroy all cards in your opponent’s hand and on their field. (1) If your opponent has 4000 or more LP, your LP becomes 1000 LP less than your opponent’s. I'm just a random person, spending time on nothing in particular.